Average vessel operating costs rose modestly for the second year in succession following two years of marked declines, but cost inflation is set to accelerate on higher insurance premiums, according to the latest Ship Operating Costs Annual Review and Forecast 2018/19 report published by global shipping consultancy Drewry. Typical ship operating costs accelerated moderately in 2018 as the uncertain recovery in freight markets across most cargo sectors gained momentum. OPEX costs are heavily linked to developments in the wider shipping market as some costs, such as insurance, are connected to asset values and others impacted by the ability of shipowners to pay. Drewry estimates that average daily operating cost across the 46 different ship types and sizes covered in the report rose 1.1% in 2018, succeeding the previous year’s rise of 0.7%. This followed a period in which OPEX spending contracted over two consecutive years by almost 9% in 2015-16 (see graph). Cost inflation was broad-based across all cost heads. Indeed, the year marked the first time in a decade that expenditure rose across all five main OPEX cost heads, marking an inflection point for the future direction of ship operating costs. The rise in costs was broad-based across all the main cargo carrying sectors with every segment experiencing some cost inflation. The latest assessments include vessels in the container, chemical, dry bulk, oil tanker, LNG, LPG, general cargo, roro and reefer sectors, as well as the recently introduced car carriers segment. Indeed, 2018 represented the first time in seven years that all vessel sectors recorded rising average operating costs. 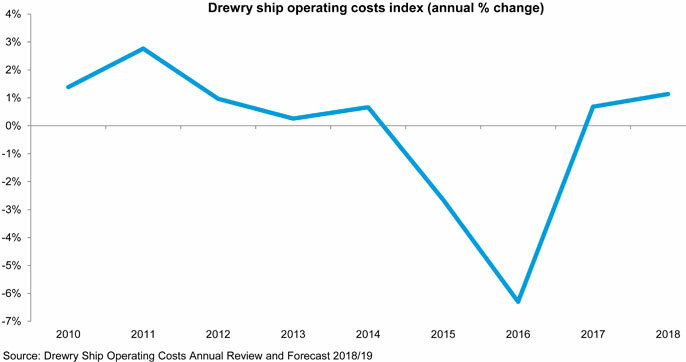 However, continued overcapacity in certain sectors and an uncertain trade outlook will still make market conditions challenging for most shipowners over the coming years, so Drewry expects the pressure on costs to continue. This will be particularly so in areas of the budget where operators have greatest control, such as manning, stores, spares, repairs & maintenance and management & administration. But other cost elements influenced by wider market factors will prove harder to control, such as insurance, where we expect spending to rise as the marine insurance market hardens. However, given the more benign outlook for the remaining cost heads, overall vessel operating costs are expected to rise below the level of general price inflation over the next few years and so represent cost stagnation in real terms.